Ed Eder and Alex Parody discussed possible learning activities for students with the teachers. Three Mount Vernon High School teachers visited Dyke Marsh on November 19, 2017, doing “advance work” to prepare to bring MVHS environmental science and biology students to Dyke Marsh soon. 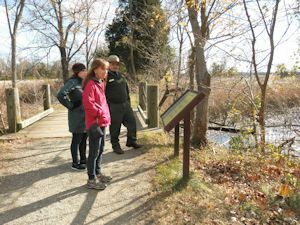 Linda Townley, Victoria Correa and Amy Niss explored the flora, fauna and habitats of the preserve with NPS ranger Alex Parody, FODMers Ed Eder, Ned Stone and Glenda Booth, and discussed plans for students to visit and learn. 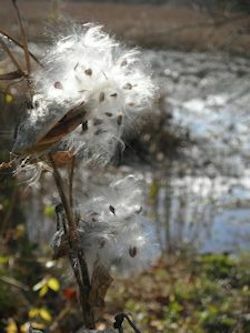 On a beautiful, sunny, November 19 Sunday, seeds were taking to the wind, waterfowl were diving and dabbling and bald eagles were soaring and perched. Glenda Booth has contributed the following photo essay highlighting some of the observations made on the walk. NPS Ranger Alex Parody, Victoria Correa and Amy Niss (pink jacket) study the wetland vegetation. 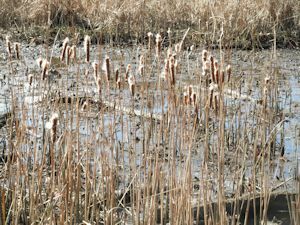 Cattail flowers were “fuzzy.” The wind was sending cattail seeds aloft. The wind was dispersing milkweed plant seeds. 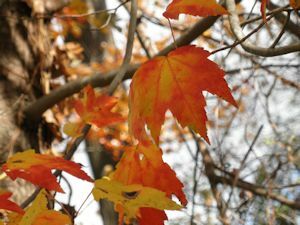 Trees were showing off their fall hues. 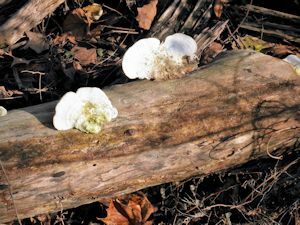 These shelf fungi were “perched” upright because the log was turned over.